“Three sisters” refers to the wonderful combination of beans, corn and squash â€” foods traditionally grown and consumed together by many American Indian tribes. Drain and rinse soaked beans. Put them in a pot and cover with water by an inch. Bring to a boil and simmer for about 45 minutes or until tender but not mushy. Add more water if necessary. While beans are cooking, cut squash in half and scoop out seeds. Bake squash halves, cut side up, in a 375-degree oven for about 45 minutes, or until tender. 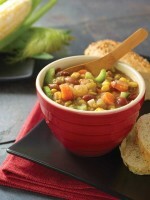 This entry was posted in Simple Living and tagged winter hearty soups on 2009-12-03 by Christine.